In the late 1980’s Jim Dine created a series of drawings reinterpreting works of sculpture in the Glyptothek Museum in Munich. In doing so, he restored an age-old practice of drawing from the classical form, but did so in a manner that tried to make the old forms come to life. 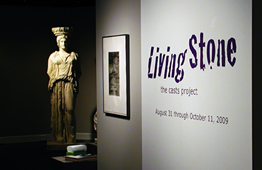 This exhibit will recreate the look and feel of this studio practice, with Dine’s prints from his Glyptotek series as the backdrop, plaster casts originally used in studio schools, and artworks from classes and visitors posted on the gallery walls. Classes from the Department of Art & Design at Purdue as well as from the regional K-12 community are invited to participate in the active studio/gallery, with the opportunity to add their artworks to the growing gallery display. The Dine prints are presented on loan from the permanent collection of the Art Museum at the University of Kentucky, while cast sculptures are on loan from the Wright State University Department of Art & Art History.